The gastronomy of Florence is something to be behold. As I discovered, visiting the venerable institutions of Caffè Gilli and restaurant Cibrèo, there is one vital ingredient that you must bring for yourself, however: time. I was meeting my friend, Susanna, a talented artist and recent transplant to Florence at Caffè Gilli, the 280 year old establishment situated on Piazza della Repubblica. As I waited, I overheard two young tourists discuss whether queuing in Gilli would be worth it. They elected to save time, and stick to a hurried tour timetable, by grabbing a coffee-to-go elsewhere. The folly of youth. I nosed inside at the glass counter stocked with rich cakes and gelato. 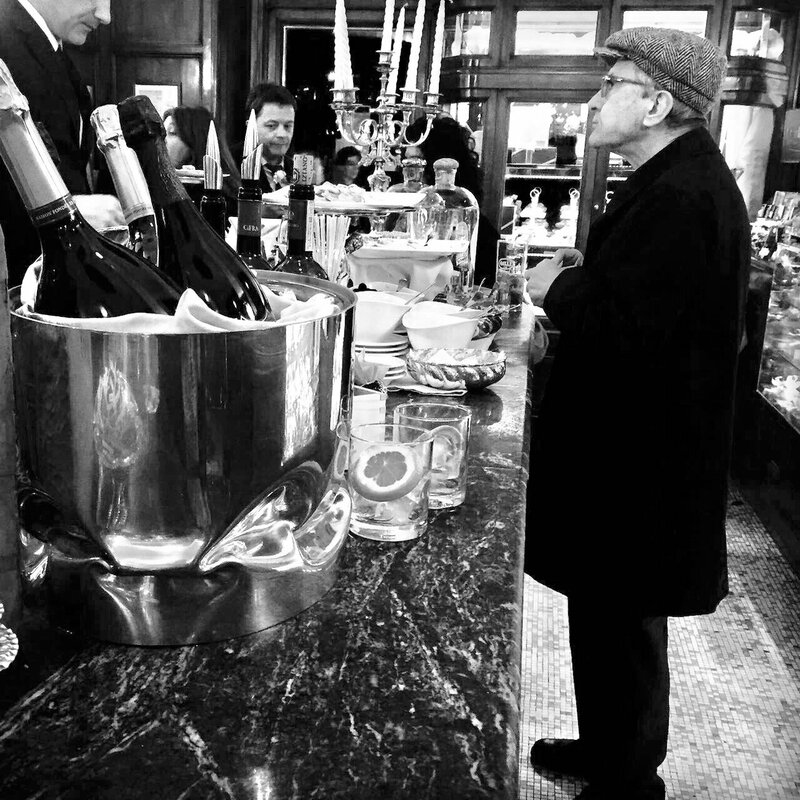 The main counter was green marble, busy with immaculately aproned waiters at work one side and, leaning against it on the other, were well dressed locals sipping espressos. Susanna glided in, in a flowing white cotton dress, removing her large brimmed hat and sunglasses as she did so. Effortlessly chic, her easy elegance must have caught the waiter’s eye. He ushered us through to an adjacent and largely empty room of small round tables, a high ceiling and awash with sunlight from the large windows overlooking the piazza. Dressed in a crisp white jacket, white shirt and navy tie, our waiter’s grey hair was neatly coiffed, with just a few strands awry to suggest that, despite exuding placid and serene servitude, his job was a harried one. A table in the window was offered and, no sooner than accepted, a white table cloth was whisked into place. Our waiter charmed us briefly in undulating tones, mixing English with Italian for Susanna. Caffè Gilli is place where they ask your name, not to scrawl a misspelt version on a cardboard cup moments later but so they can address you appropriately, when returning to your table. We asked for two white Americano coffees, almost embarrassed, given the grandeur that was Caffè Gilli and the aperitivos and dolce on offer. Our man soon returned, hunched slightly over a heavily laden tray. Our table was then adorned with grand silver coffee pots, china cups and saucers, a metal box of assorted sugars and a small plate of delicious chocolate wafers. Between the historic setting, elegant Susanna, our crisply attired waiter and the steaming caffeinated silverware before us, it truly was a scene fit for a stylish movie of a bygone era. Absorbing the moment, we sipped our coffees, chatted nonchalantly and gazed upon the piazza where a children’s merry-go-round slowly rotated and glinted in the sunshine. I could have left Caffè Gilli and thought of that moment as a rare treat; a one-off in time. However, Gilli is not alone in Florence in delivering a sense of occasion; a moment in time. By the time we entered at 8pm, though perhaps early by Italian standards, the restaurant was already full and the gentle patter of conversation ebbed and flowed from each table. From the thick dark green carpet to the wood panel and cream painted walls, from the heavy cutlery laid upon the crisp table cloths to the deep red velvet chairs, this was not so much a house of food but a homage to it. Like all good things, the evening was not to be rushed. We waited a disproportionate length of time for the sommelier to arrive and painfully longer still to sip a drop. When the menu arrived, it listed only two options: two courses or three. Unannounced, Signora Picchi herself pulled up a chair next to our candle lit table. Relaxed and warm, she set about describing each of the menu choices. She did so with a pathos and a wistful stare into the middle distance, as if fondly recounting cherished stories from her youth. Choices made, the procession of food commenced. The anti-pasti arrived in small white dishes, covering our table: yoghurt mousse with turmeric, chicken liver crostini, prosciutto, paté, chilli tripe salad, olive oil drizzled broad bean salad and more besides. Had I known I was going to write lovingly about this experience, dear reader, I would have taken notes and some photos. As it was, my mind was happily caught up in the gentle flow of our insouciant conversation. The courses arrived with the quietly proud hospitality that epitomises Cibrèo. Antipasto became primo, primo became secondi and so the meal continued. Each course was fresh, inventive and true to its Tuscan heritage, delighting the palate. Not until the offer of dolce came did we hit the sudden realisation that we were both really quite full. So we ordered dessert, anyway. At some latter part of the evening, a table of six or more arrived. Their restlessness caught my eye, not least because every other diner was happily ensconced in the ambiance, the food and good company. The slow moving provision of menus and a lack of the sommelier’s attention caused the group such angst, that they left within ten or fifteen minutes, bemusing diners and staff alike. Such short term-ism rather misses the point of Cibrèo. By the time we left, the restaurant was empty and closing. After a brief closer inspection of the various paintings, we paid our un-ending respects to the staff for such a wonderful evening and exited onto the warm late evening cobbled street. The walk home may have been slower than the walk there but such is the point of Florence. Caffè Gilli and ristorante Cibrèo exemplify a city where no morsel of food or culture is to be rushed; Firenze is a city to be savoured only at leisure.